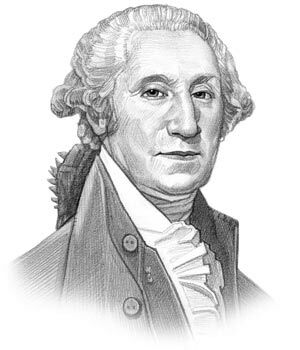 George Washington was the 1st President of the United States who served in office from April 30, 1789 to March 4, 1797. What was the life of George Washington like? The short biography of President George Washington covers important information and facts about his early life, his family, career and the famous events and achievements of his political life. Our short biography of George Washington provides an interesting and easy way to learn about the life of the President. The following important facts provide a fast overview of important facts about President George Washington. Facts and Info: George Washington was the first president of America. He helped to establish the federal government and aspired to create a free, democratic and united country. For additional info refer to 20 Facts about George Washington. Facts and Info: He was born on February 22nd 1732 in Westmoreland County, Virginia and was the eldest son of Augustine and Mary Ball Washington who were prosperous Virginia gentry of English descent. George Washington died on Saturday December 14th 1799 at his Mount Vernon estate in Virginia. Facts and Info: The career of George Washington included the roles of a Surveyor, Farmer, Soldier, Politician and Statesman. He was the Commander in Chief of the Continental Army during the American Revolution. He became the 1st president of America in 1789 and served for 8 years until 1797. Facts and Info: George Washington married Martha Dandridge Custis in 1759. She was a wealthy widow with two children whose names were Jackie & Patsy. George and Martha never had any children together. Facts and Info: George Washington was Independent but had strong sympathies with the Federalist Political Party. He was 57 years old when he was inaugurated as the first American president. John Adams stood as the Vice president. He was the only president who was unanimously elected and ran unopposed for both his terms of office. For additional facts refer to his Presidential Cabinet members. Short Biography of George Washington: What he was like! Facts and Info: He was descended from English royalty and became one of the richest men in America owning a considerable number of slaves. He was an imposing figure standing at 6 feet 1.5 inches. He was also a brave commander and fought in the wars against the French and Indians. In recognition of his lifetime achievements George Washington has appeared on the twenty-five cent piece since 1932. Facts and Info: During his lifetime he played a key role in important events of the era. George Washington was instrumental in the American Revolution in which the American colonists won independence from British rule, the 1791 Bill of Rights and forming the Constitution of the USA. Other important events of his presidency included the establishment of the National Mint, the Census and the Post Office. The Whiskey Rebellion, the Formation of the Political Parties, the French Revolution, the Neutrality Proclamation of 1793, Jay's Treaty and Pinckney's Treaty. Facts and Info: During his life George Washington suffered from Malaria, Smallpox, Tuberculosis, Dysentery and Pneumonia. This was not unusual for this time period as medical knowledge was in its infancy. What is surprising is that he survived these illnesses and lived to the age of 67. Facts and Info: He died of pneumonia together with an infection of the larynx that resulted in suffocation on December 14, 1799 at his Mount Vernon estate. On the centenary of his death there was a move to have his body moved to a crypt in Washington but this idea was strongly resisted in the South and he was therefore placed in a new, bigger tomb at Mount Vernon. The key to the tomb was symbolically thrown into the Potomac River. The short biography of George Washington provides a fast overview of the key facts and events about his life and the accomplishments of his presidential term in office. The following George Washington video enables you to sit back and listen to the history of his personal and political life - a useful educational resource for kids, children and schools learning about the life of President George Washington.